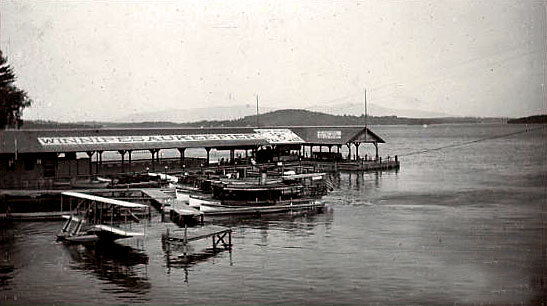 In this rare photo, dated August 25, 1921, we see that originally, the seaplane base was located between the Mount Washington wharf and the Winnipesaukee Pier, and that it was only later, perhaps after the Irwin’s Winnipesaukee Gardens were built in 1925, that the seaplane base relocated to the other (southern) side of the wharf . 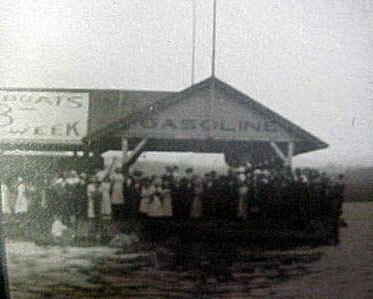 The sign in the photo says “Passengers Carried – 15 minutes – $10.” The steamer Governor Endicott is docked at the Mount Washington wharf. 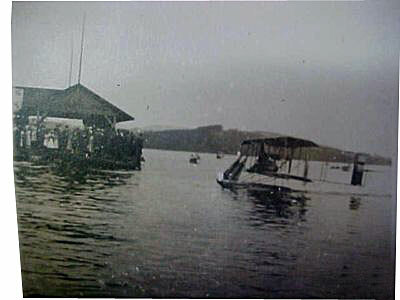 Note the propeller of the seaplane in the photo. 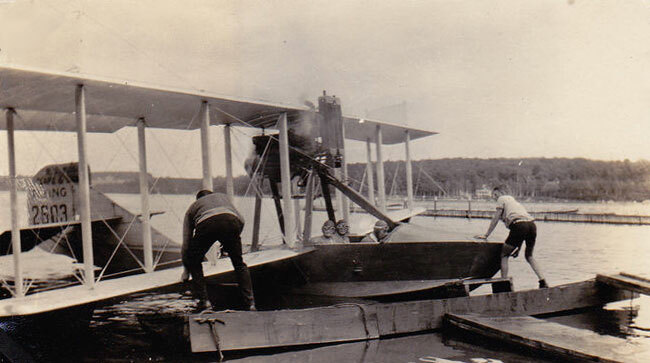 It is mounted in a “pusher” configuration, with the engine in front of the prop, unlike modern seaplanes, where the propeller is in a “tractor” configuration, with the engine mounted behind the propeller. 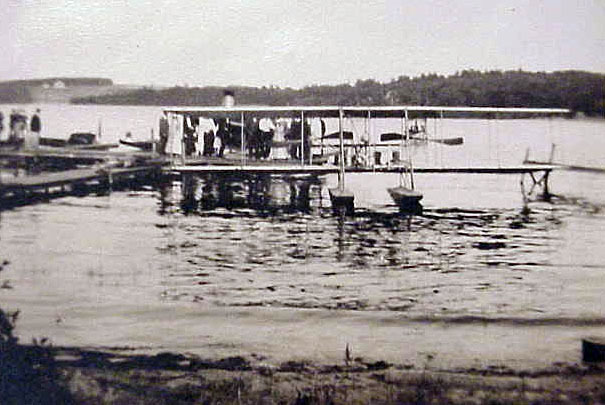 Note also that this primitive seaplane, or “flying boat“, landed on its belly. 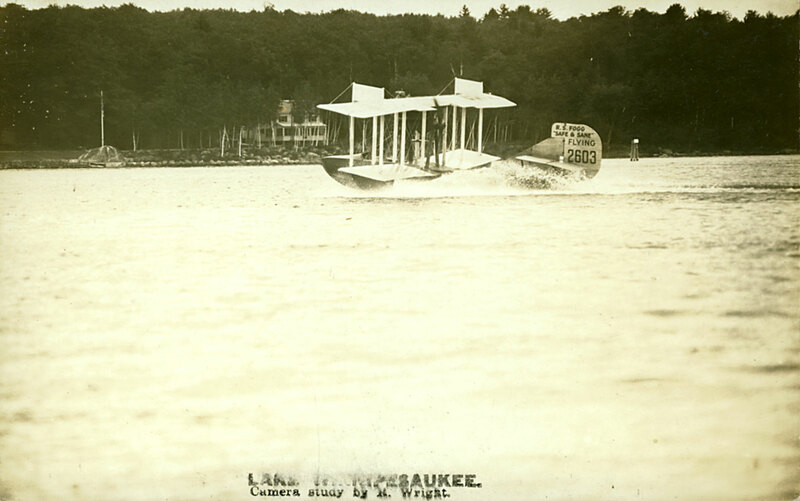 The photo below shows what seems to be the same seaplane as in the above photo, a Curtis MF “Sea Gull” model. Equipped with a 150hp Hispano-Suiza engine, the plane’s top speed was 69mph. It could carry four passengers, plus the pilot. The plane is seen near the Weirs Channel, with the Interlaken Park boulder and flagpost visible to the left. 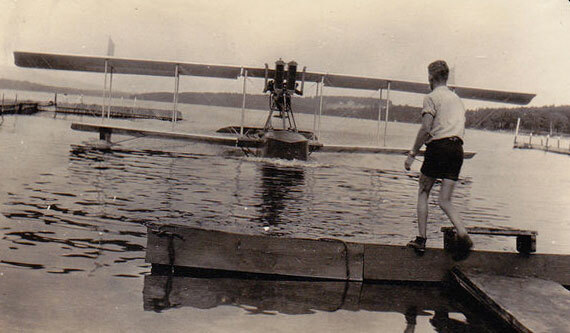 On the tail of the seaplane, the marking “R.S. 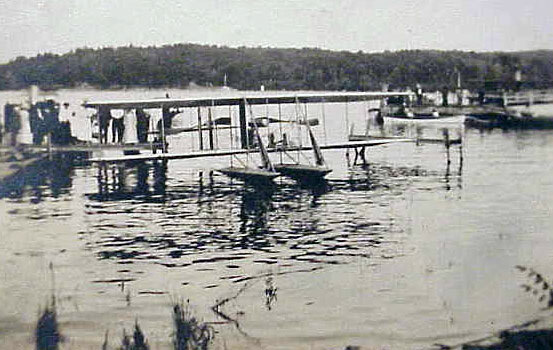 Fogg ‘Safe and Sane’ Flying shows that the operator of this seaplane was none other than Bob Fogg, who went on to establish the U.S.’s first airmail postal delivery service. 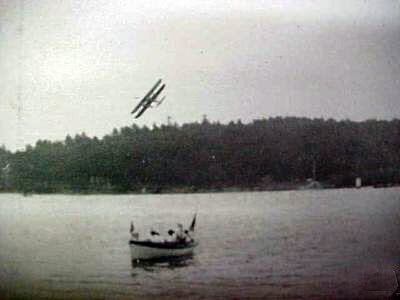 Fogg operated the Sea Gull until 1929, when he upgraded his service with newer model seaplanes. 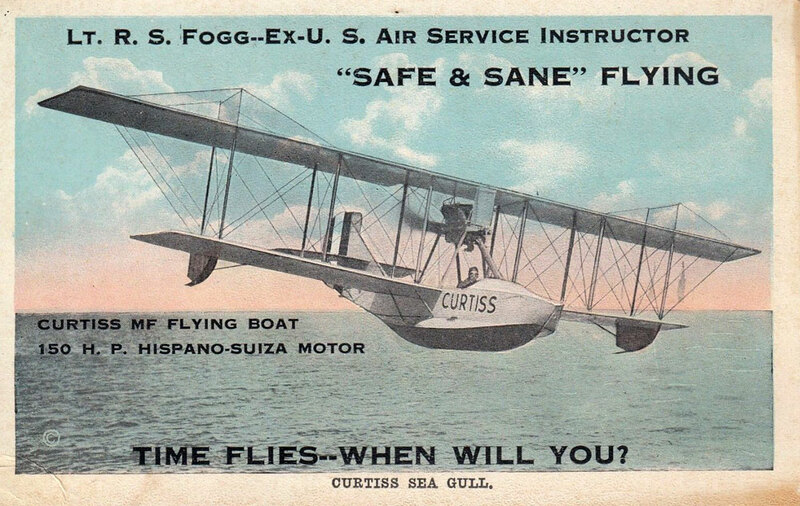 An advertising postcard for Fogg’s “Safe and Sane” flying service. Fogg’s slogan was “Time Flies–When Will You?”. 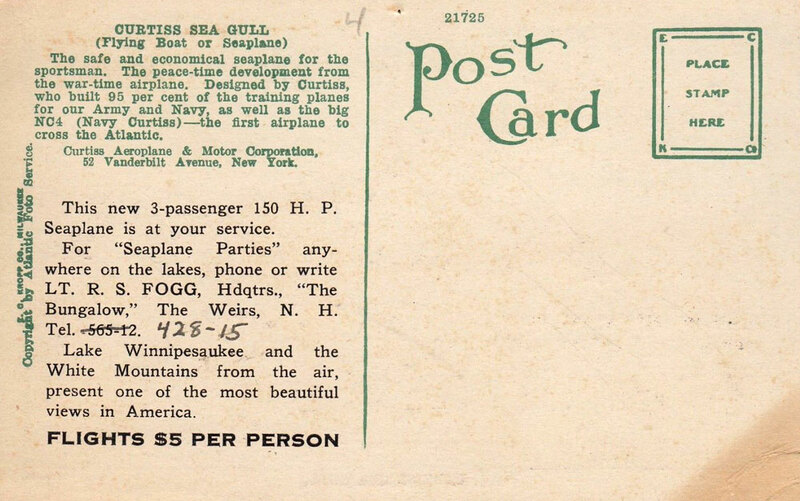 The reverse of Fogg’s advertising postcard. Flights cost $5 per person – a considerable sum in the 1920s. Here are a pair of photos of the Sea Gull with pilot Bob Fogg and passengers. The photos were taken August 11, 1927. 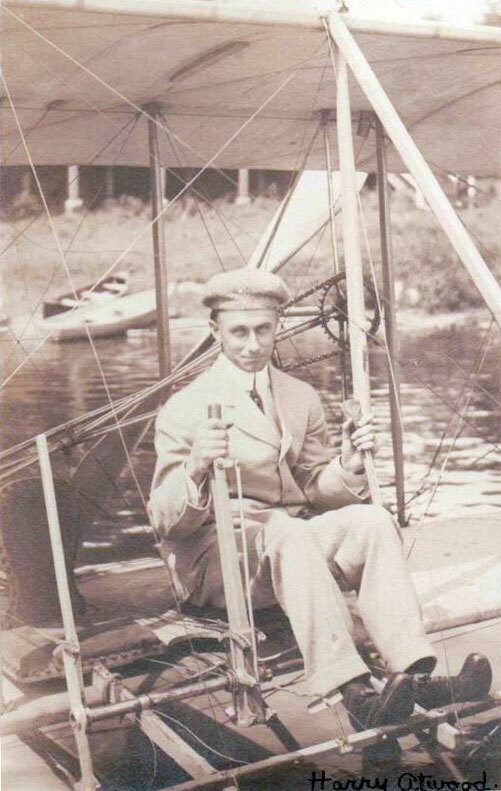 Earlier, in July 1912, Weirs Beach had been thrilled by the week-long aerial demonstrations of aviator Harry Atwood. 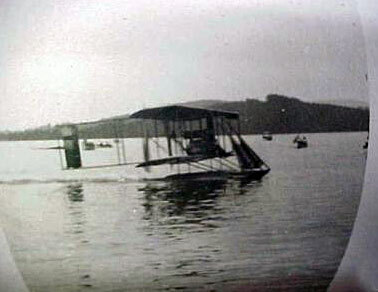 His Burgess-Wright Hydro-aeroplane landed on two pontoons. 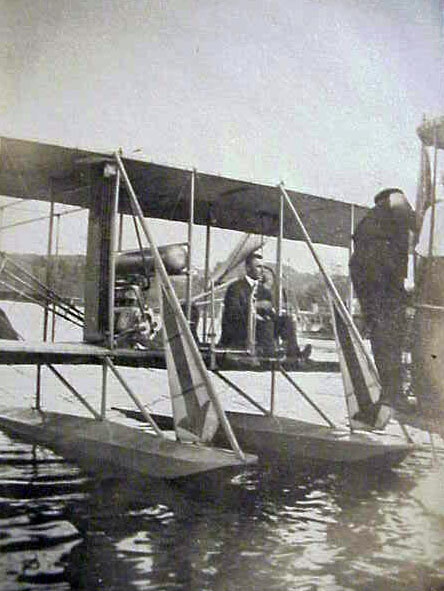 In the long run, this floatplane design became the standard design for seaplanes. 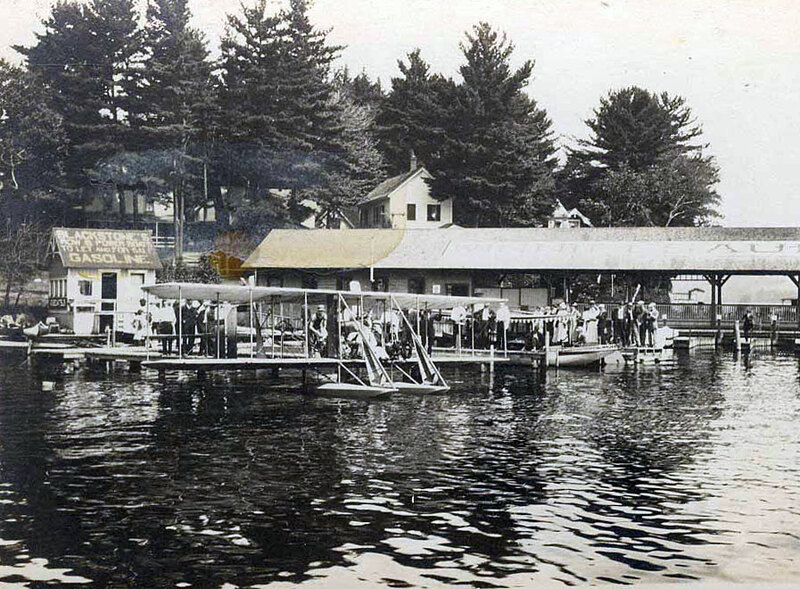 During his visit to Weirs Beach, Atwood took several passengers up on “quite a number of flights…all of them reported themselves well satisfied with the novel experience”. 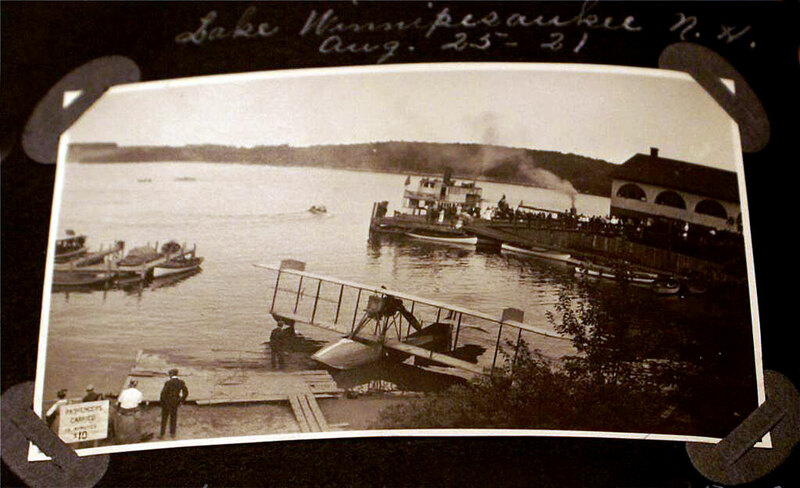 These were the first seaplane rides ever given in Weirs Beach, occuring before there was a permanent seaplane base. 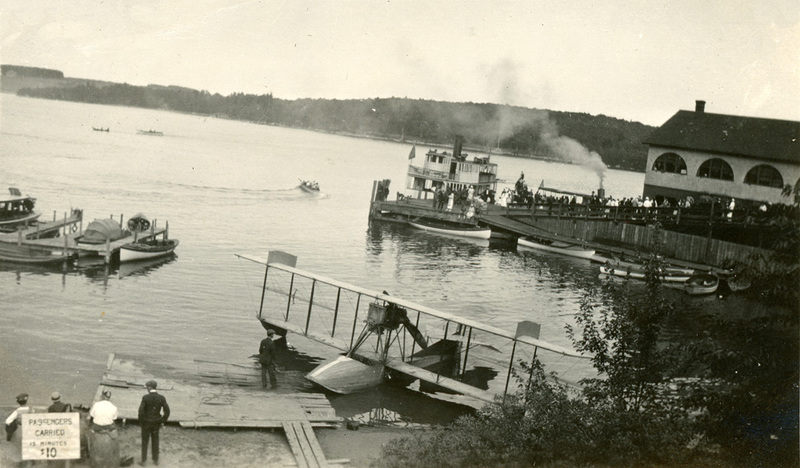 The photo below shows Atwood’s seaplane near an isolated docking island, unattached to the nearby Winnipeaukee Pier. This may have been used as a temporary base. Here’s a photo of Atwood at the controls. Here are some more photos of Atwood’s seaplane nearby the Pier. 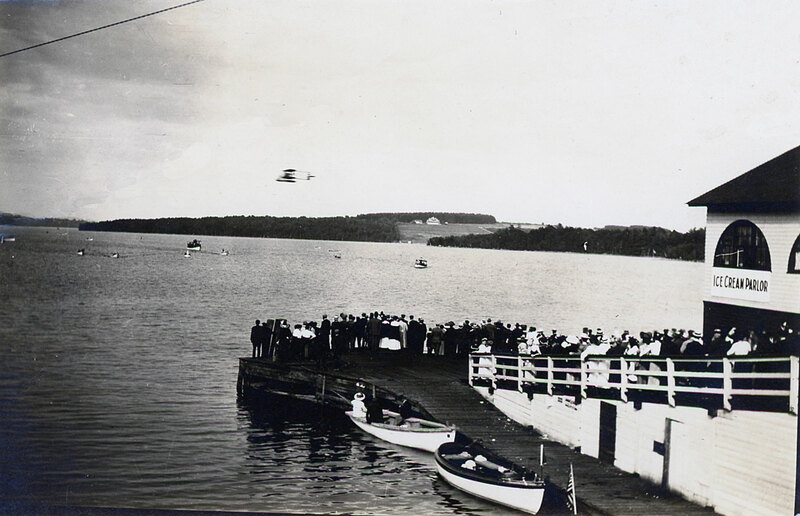 Atwood flies over the Weirs Bay while a crowd gathered at the Mt. Washington wharf watches in rapt attention. A signed photo of Harry Atwood.